This Christmas, Aaron and I decided to stay home. We haven’t had much time lately to spend in the house and, tired of work and travel, thought this would be the best way to enjoy the holidays. I wanted to create a homey and festive atmosphere and one childhood memory kept coming back to me. Back in Bulgaria, every year around Christmas and New Year, my mom used to make huge amounts of flavorful cookies covered in sugar and filled with nuts and Turkish delight. The long hours spent cracking the walnuts and rolling dozens of little pieces in powdered sugar and the vanilla that filled the air in the process had become to symbolize the beginning of the holiday season. The cookies lasted for weeks but every little bit tasted as delicious, if not more, as the previous one. I had to make them too. I got my mom’s recipe and it looked really simple. I too, decided to make a lot so I can bring to parties and give away. Not surprisingly, at a gathering with my Bulgarian friends, just the sight of the cookies was enough to elicit lots of memories and stories. Apparently every Bulgarian family had some version of these cookies, which my mom calls “little cigars” although they look a lot more like little crescents. Needless to say, everyone enjoyed them and asked me for the recipe. A bit more surprising I found it that my Moldovan friends recognized the “little cigars” right away too, and, filled with sweet nostalgia, finished the box I took to another party in no time. I was most intrigued, though, when a Mexican lady looked at them and exclaimed “Ah, those are Mexican wedding cookies”. Turns out, that cookies with very similar appearance but also ingredients (flour, lard, wine, sugar and nuts), are traditionally prepared for wedding celebrations in Mexico. Isn’t it amazing how food traditions make their way around the world? I wonder where the little powdered crescents originated. What other countries have adopted them and what celebrations they typically prepare them for. Let me know if you know their story. But even if you don’t, try the recipe below at your next party. My mom’s “little cigars” will not only bring a touch of old fashioned festivity but are sure to start a conversation. 1 small or medium box Turkish delight (Sold in Middle Eastern or international food stores. My favorite flavor is the classic rose.) Cut each piece into 4-5 smaller rectangular pieces. Place a cup of flour on the bottom of a mixing bowl. 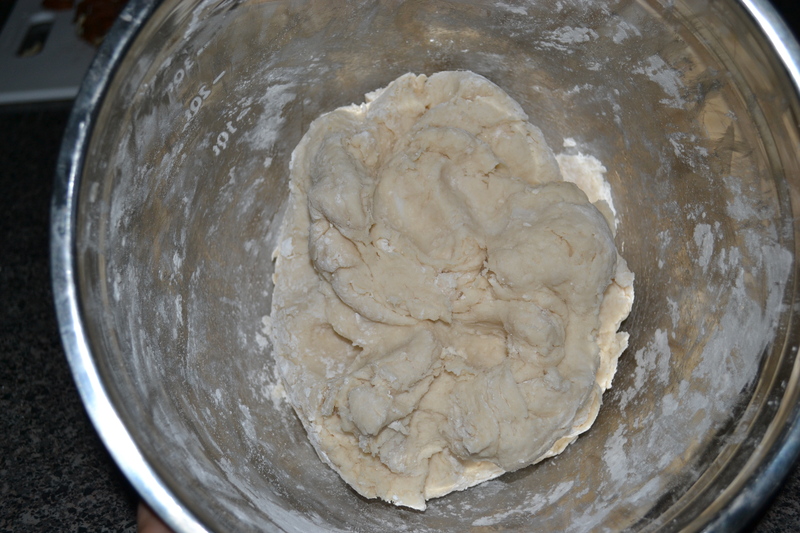 Create a “well” in the flour and add lard. Add ½ cup powdered sugar, wine and vanilla. Mix well (with your hands) adding flour as needed, until dough is semi-hard. It should be slightly crumbly. Divide into two balls. Roll each ball into a circle to about less than a ¼ inch thick. Cut triangles (base about 3 inches wide). 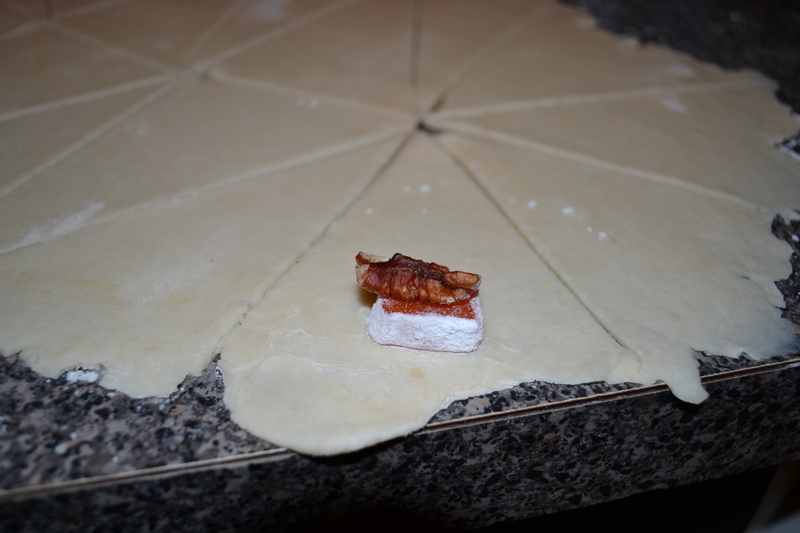 Place a small piece of Turkish delight and a pecan quarter towards the bottom of each triangle. Roll into crescents. Makes about 60 cookies. Place on a greased cookie sheet. Bake until just slightly golden (15-20 min.). Roll crescents in a bowl of powdered sugar while still warm (so the sugar sticks better), but not hot (so it doesn’t melt). 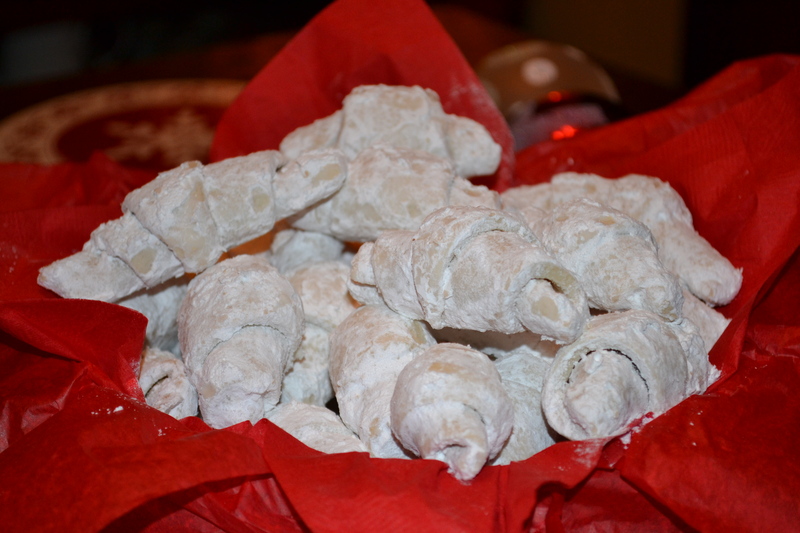 This entry was posted in Bulgarian Recipes, Cookies, Sweets and tagged Baking, Bulgarian Tradition, Christmas, Lard, Mexican Wedding Cookies, Turkish Delight. Bookmark the permalink. 12 Responses to A holiday tradition. In Bulgaria. And around the world? I’m curious about Turkish Delight. I’ve never heard of it, what is the consistency like? I see the photo of it, but I can’t tell if it is chewy or like a hard candy. Recipe sounds Delicious!!! Turkish Delight is soft, chewy, a little like jelly. It is often made with nuts: walnuts, pistachios, hazelnuts. It also comes in many different flavors like mint, cinnamon, lemon, coconut, etc. It is very sweet and that is why they make it in little bite-size pieces. My favorite flavor is the rosewater as it is so typical of the region. All Middle Estaren and Balkan countries have it. Originally it used to be sweetened with honey and mollases but the ones that are commercially produced and sold in the West now are unfornatuly sweetened with corn starch. I still love a bite once in a while though. 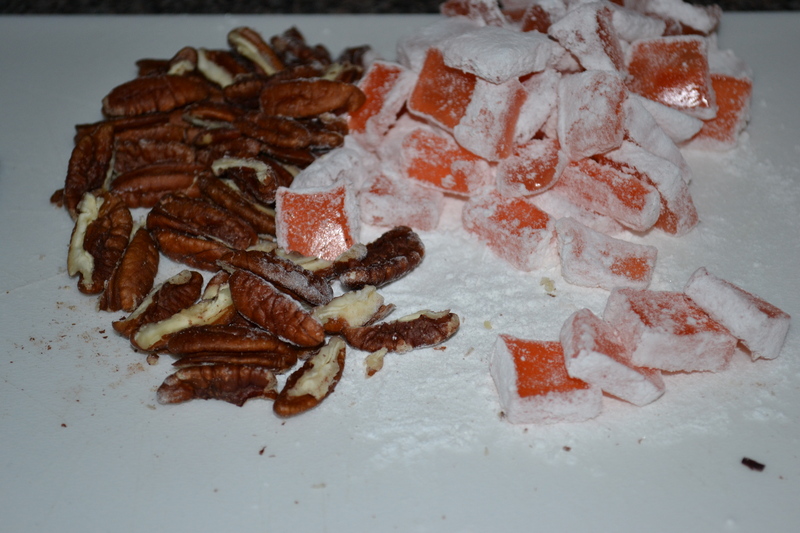 Here is a neat story of how it originated in the 1700s in the Ottoman Empire http://www.turkeytravelplanner.com/details/Food/TurkishDelight.html. Anna — great start. I can’t wait to make these. Terrific pictures. Maybe the taste will awaken a memory. Thanks, Susan. I bet they have something similar in Germany. Now I am curious to check. Ha, check this out. A German recipe circa 1929. Not exact but quite similar. Those German crescent cookies sound great. 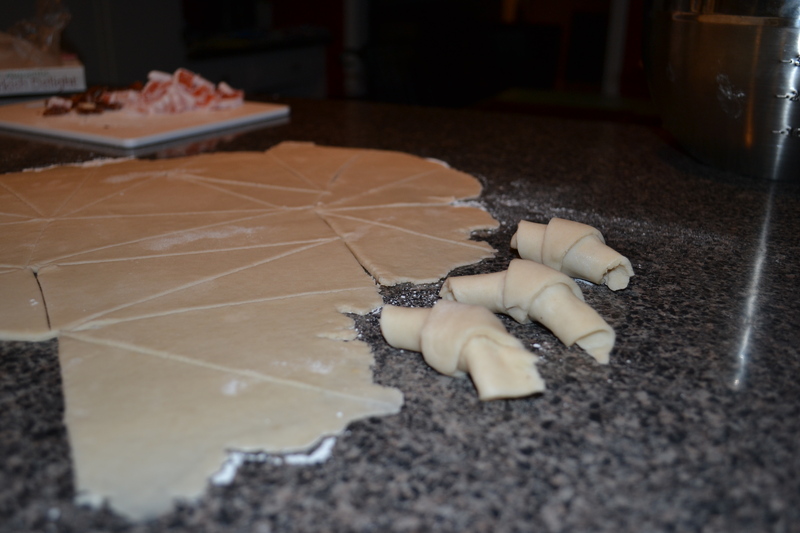 I understand that some Bulgarian holiday cookies have a dry, hard consistency with caraway seeds. That reminded me of the Christmas cookies my German heritage father would buy every Christmas from our neighborhood bakery. They are called Springerle and have anise instead of caraway seeds. They are square with holiday pictures embossed on the top. Does that sound like the Bulgarian cookies? Also, I remember Pfeffernussen — small, round, hard cookies. I’m sending this website to a friend who is of Italian heritage and a great cook. She may know something about the Turkish delight crescent cookies. Annie, very impressive pictures and descriptions. Around Christmas table we had a discussion what we call these delicious white cookies in Bulgaria. Everyone had a different opinion. What a shame?! And than in my dream I went back in my childhood memories and I remember now (as I made these cookies very offten) we call them “Purichki”…. These cookies are just like the kind that my grandmother used to make – in Moldova. They are great with cheese too (ricotta sweetened cheese) or halva. I am not sure how to describe what “halva” actually is – I think it originally comes from Turkey and in Moldova it is made from sun flower seeds. This is a great idea. Next time I’ll try them with halva. I love halva – sesame seed or sunflower seed sweet from the Middle East.